Affordable Four Season Family Cottage - Live the lake life! - Private 1/2 acre lot across the road from lake featuring: cedar hot tub/screened gazebo, outside shower, mature trees, & fire pit area. 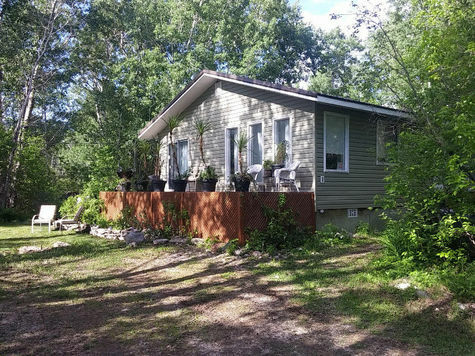 - 1100 sq' cottage with 2 bedrooms, 4 piece bathroom, open concept living area, washer/dryer, furnace, tin roof, & vinyl siding. - groomed hiking/biking trails, close to sandy beach, fishing, trails for atv or snowmobiles. - Limestone cliffs and rock that Steep Rock is named after colour the water an amazing turquoise. Cottage can also be an excellent source of rental income if buyer desires. Call me to make an appointment or for more information. Motivated to sell.